Heart racing. Palms sweating. Words trying to make their way out of my mouth. I suddenly felt as if I could understand my son Mikey’s struggles to communicate. Looking out at the strange faces (full of expectant looks of anticipation) looking back at me, made me realize just how uncomfortable a situation like this could seem to him and other autistic children. 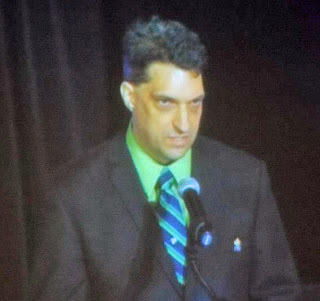 I was standing in front of an audience of about 400 people who were waiting for me to deliver a speech about autism. I had been honored to be asked to address the Young Autism Program’s annual charity dinner event, but I’m a writer…not a public speaker. Hence the knee-knocking fear surging through my body as I stood at the podium (which was already an accomplishment, as I had bet that I’d trip up the stairs on my way to the stage). But three things rescued me from the fear. One, as with many challenges I’ve faced as an autism parent, I found an inner strength I didn't know I had. Two, I got a laugh after my first joke. And three, I was surrounded by that unique, uplifting strength that only the autism community can provide. I opened my mouth and began to read my speech…seventeen minutes later there were tears, laughter, and applause. That charity dinner event took place just a few days after the end of Autism Awareness Month. My speech was about being an autism parent but, more importantly, about the necessity of the autism community to support each other year-round. The reaction to my speech spoke volumes about how we all share this common journey on the road of autism and that sharing our experiences is a valuable, comforting, and sometimes inspiring exercise. Rollo May, a psychologist, said “Communication leads to community, that is, to understanding, intimacy and mutual valuing.” When we have events like this dinner or an autism awareness month, or even just a couple of parents sharing stories outside their children’s school, we are acting as a community and creating understanding and the value our children deserve. Many of our children, family, and friends with autism cannot speak for themselves. And that is where a strong community comes in…it speaks (through words and actions) on behalf of those who can’t. When you stand up for your child’s needs at their IEP meeting, join an organization like the Autism Society, or donate to a local autism charity, you are speaking for someone with autism. Let’s all strive to be a voice in the autism community. I can guarantee you that it is the most rewarding feeling you’ll ever have. And if you ever find yourself petrified and afraid in front of hundreds of people hanging on your every word, tell a good joke and remember these beautiful words of wisdom: Speak your mind even if your voice shakes (Maggie Kuhn, Social Activist).